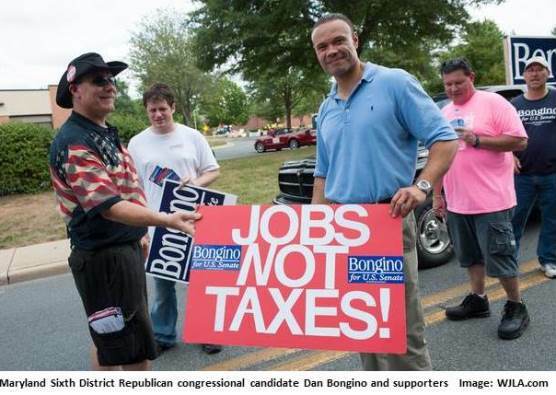 Bongino is a former Secret Service agent now running for Congress against incumbent liberal Democrat John Delany in Maryland’s Sixth Congressional District. Bongino, who friends describe as Republitarian (libertarian-leaning Republican) has been knocking on doors and raising a near-record amount of money, but to the national GOP insiders Bongino’s grassroots campaign has hardly been a blip on the radar as they focused on protecting vulnerable incumbents and electing more establishment-friendly candidates in safer districts. But Bongino and his disciplined volunteer corps have hit thousands of doors in the district and raised over $500,000 in the most recent reporting period. And even the left-leaning media in Maryland allowed that he pretty much eviscerated his opponent, incumbent Democrat John Delany, during a recent debate and that Bongino’s grassroots campaign is having a success that is now the talk of Maryland’s most astute political observers. Now Bongino has launched his first TV ad, and it is as hard hitting as Dan was during the debate. The ad, entitled “Why We Fight” is a powerful indictment of not just Delany, but the entire DC establishment. Here’s a link so you can watch the ad, the script is below and here’s where you can donate to Dan Bongino’s campaign – we endorsed Dan Bongino back during his primary and if you love liberty we think a donation to Dan Bongino's campaign will be the best investment you make in 2014.